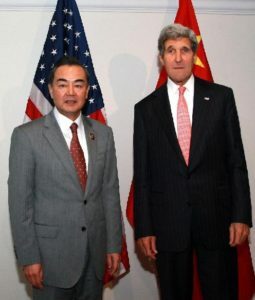 WASHINGTON — The rising influence of China has longtime American allies South Korea, Japan and the Philippines on alert. U.S. Secretary of State John Kerry visited the Philippines to strengthen ties in the region and visit the disaster-hit regions of the southeast Asian ally. Reuters reported that Kerry tried to downplay rising tensions between the U.S., her allies like Japan against China, which has been aggressively asserting itself in recent years over territorial claims. He called for more peaceful efforts and talks between China and their East Asian neighbors, although China has not backed down from their aggressive rhetoric. He spoke of arbitration to resolve such disputes, and indicated that the U.S. will speak out if China continues to aggressive take unilateral actions in the region. He went on to say, “We are not approaching this with any particular view towards China except to say when China makes a unilateral move, we will state our position and make clear what we agree and disagree with”.